Well for start a little about story.. It is a bit “basic” story from my point of view. A little girl becomes Chosen One and has to go far “to save the world” and become an angel. In the way to do so she has to sacrifice all that makes her a human being. She is accompanied by her teacher and warrior. Also there is her love Lloyd and brother Genis who also comes along. Usually stories like this takes a lot of eps to discuss the right and wrong, the difference of saving one person and all world… this takes only 4 eps so its a bit shorten and squeezed (if i may say that).. The girl wants to save the world because it is the world her love lives in and she wishes happiness for him, but on other hand how can he be happy if she is all his world and the one she is saving for him without her doesn’t have real meaning for him anymore… (did you get that?.. because I lost myself somewhere between he-she-her-his-world…) Love is beautiful isn’t it? Makes people do crazy things..
On other hand (from love stuff.. hmm ok I’m getting way too many hands here) there is “world saving” thing that is concerning others, angels to be precise. Because the girl is chosen to be a new reincarnated god or something like that.. It had a name which i don’t remember (comene…). So they don’t like the idea of girls love (when I usually say love I refer to hero guy) trying to save her. Well when I read that this is made based on the game I understood more why its so shorten. But still it would be nice to see full story in more detail and more emotion, because now its just a little catching your heart leaving a lot of unseen and you feel like something is missing.. well of course there is, because I still didn’t see the rest of the ovas (there is more).. stupid of me ^.^.. 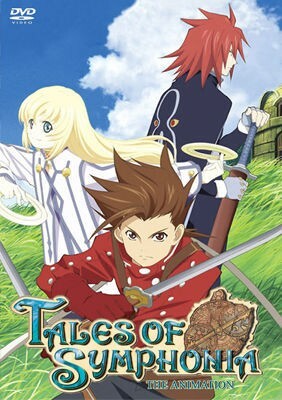 This entry was posted in OVA and tagged 2007, Harou Sotozaki, Kousuke Fujishima, Tales of Symphonia. Bookmark the permalink.